Between 1904 and 1965 South Georgia served as a base for the Norwegian and British whaling fleets in the Antarctic Ocean. Permanent whaling bases were constructed at six sites across the island, where whalers and support staff endured both the harsh climate and dangerous working conditions to supply the world’s then huge demand for precious whale oil. When whaling began to decline in the 1950’s the bases were gradually abandoned, with the last finally closing in 1965. As the surviving buildings are of corrugated metal construction, exposure to the severe weather of the region has accelerated a decline in both the fabric and safety of the structures in the fifty years since the sites closure. Many of the sites are now off-limits to tourist and visitors due to their poor structural condition and the possible presence of asbestos. 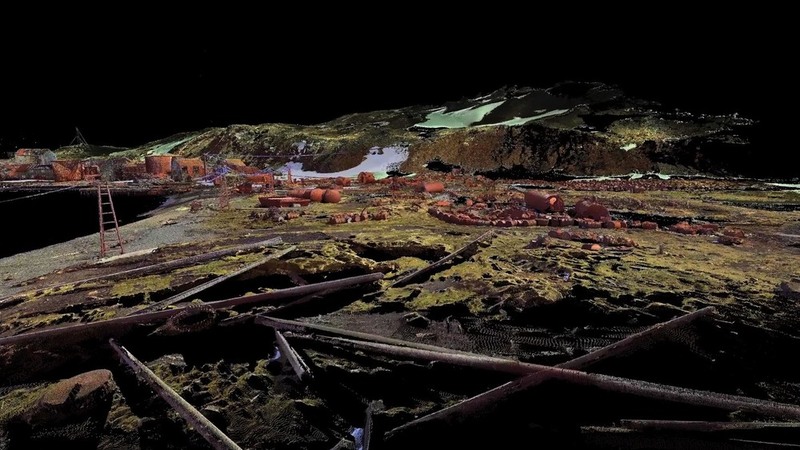 In the summers of 2013 and 2014, the Government of South Georgia and the Norwegian Directorate for Cultural Heritage commissioned a detailed LIDAR scanning survey of the remains of the whaling stations on South Georgia. The aim was to preserve a record of the stations so that future generations might better understand the way of life that took men to the very edge of the Antarctic Ocean. The scanning process was documented by Keo films as part of the filming for BBC Four television series ‘Britain’s Whale Hunters: The Untold Story’ for which Shadow Industries provided design and animation. Lidar is a remote sensing technology that measures distance by illuminating a target with a laser and analysing the reflected light. Lidar scanners store the shape of the object that the laser strikes as a series of point co-ordinates. 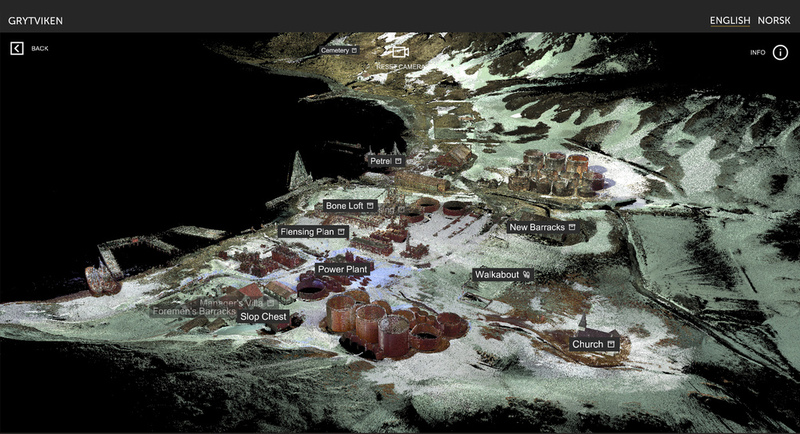 Due to the nature of their often ragged 3D shape, these sets of co-ordinate data are often referred to as ‘point clouds’. The scans carried out at the South Georgia Whaling sites are of some of the largest data sets in the world - upwards of 10 billion points. A single Ascii scan file for one single station is often be as large as 1TB. This makes it too large for reliable ‘realtime’ manipulation, even by the current generation of commercial Lidar applications used by the scanning and survey teams. Due to the unwieldy nature of the dataset, it was to be placed in the archive of the British Antarctic Survey, until computing power advanced enough to make it accessible to the public. In 2015, after work on the TV documentary completed, Shadow Industries approached the Foreign and Commonwealth Office to look at the possibility of developing an interactive exhibit based around these Lidar assets, that could be viewed by the public in several museums across the world as part of a wider cultural heritage programme. The new application would allow visitors to explore selected Whaling Stations through the use of next generation computer technology, without the need or risk of visiting the actual sites. The application was designed to provide a thought provoking primer to the history of whaling at the South Georgia sites. It’s main role is that of a time capsule, to provide a lasting repository for the stories of the whalers and their families that underwent such hardship at the very edge of the habitable world. As many of the surviving whalers are now in their 70’s and 80’s, this represents one of the last opportunities for their eyewitness accounts to be captured and displayed to the wider public during their lifetimes. The application is designed to allow users to navigate four whaling stations through large touchscreen interactive displays. The main navigation is constructed directly from the Lidar data with users able to move through the sets from a mixture of aerial and ground perspectives, exploring the sites in their own time and at their own pace by selecting sites and buildings that are of interest to them. Housed within key buildings are short films created from interviews with the whalers, film archive, and photos often that the whalers took themselves during their time on the island. Entering locations allows users to hear the whalers stories first-hand and see images of how the stations, ships and factories appeared during the height of the industry. 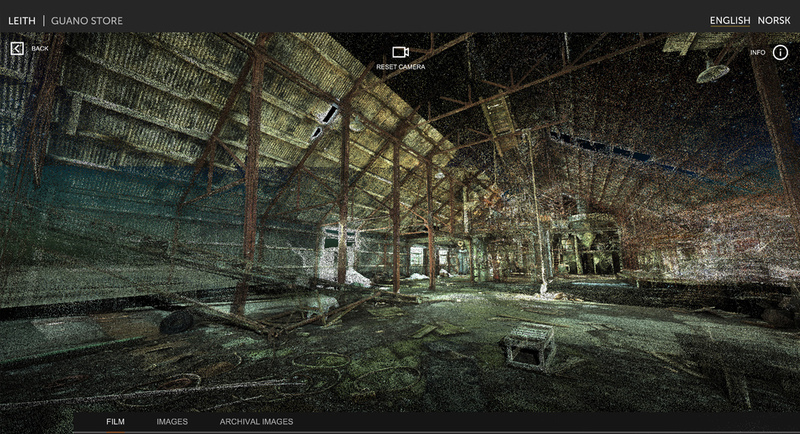 To house all this, shadow combined the point cloud data with cutting-edge video game rendering technologies to allow for realtime manipulation of Lidar data, creating tools to correctly filter and chunk the data in to sections that the high-end graphics cards could display in realtime. Designing the application and its playback hardware together, allowed users to see interactive buildings chunks often at full 1:1 resolution - up to 50 million points at 60 frames per second. Shadow also designed and oversaw the manufacture of the computer hardware used to playback these huge data streams in realtime. They also oversaw the manufacture of the custom kiosk stands that were built in China. App design, production of the short films, and coding were all undertaken in-house as part of the project, along with all project production and management for both the Norwegian and British governments. The exhibits are now on permanent display in four museums worldwide - the Fram Polar Expedition Museum in Oslo, the Whaling Museum at Sandefjord, the Historic Dockyard Museum in the Falkland Islands, and a special unit designed to withstand the harsh winter conditions at the Grytviken Museum, South Georgia. Shadow was awarded the RTS 2016 for Digital Creativity and nominated for a BIMA 2016 in recognition of its work on the piece.